Green Acres is an organic mixed arable and livestock (beef and sheep) farm that my wife Liz and I have been farming organically for 18 years. 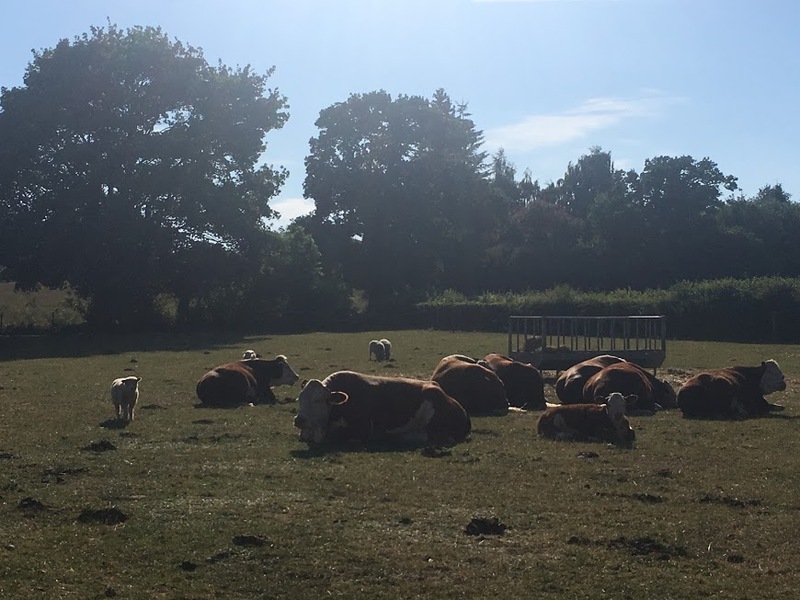 We have been breeding cattle for 10 years (we have a herd of pedigree Hereford cattle), and have recently introduced sheep primarily to help with weed control. We are also enjoying engaging people with the farm. We have a classroom providing a base for on-farm education, and are connecting more and more with people who eat the food we produce. 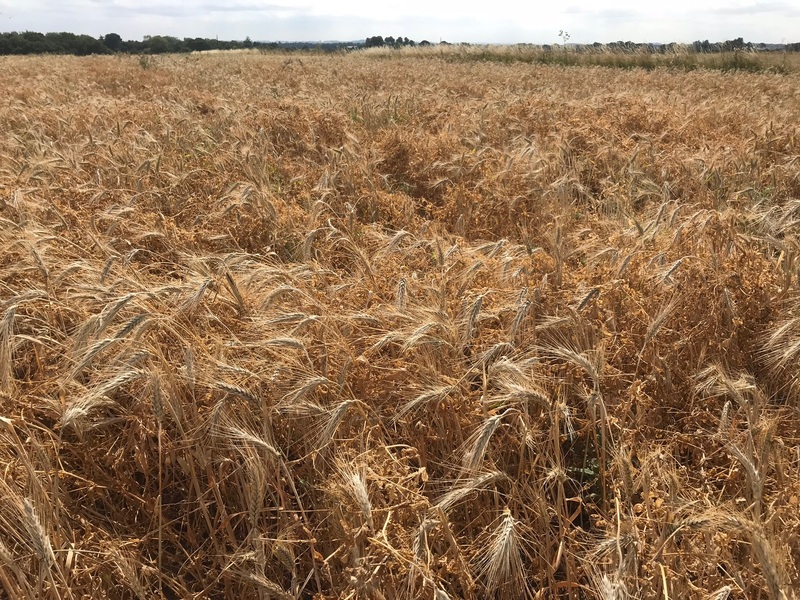 For the last few years we have been growing the ORC Wakelyns Population; a highly heterogeneous winter wheat made from 190 crosses of 20 different varieties. We grow it because of the increased resilience to pest, disease and climatic risks that we gain from having so much genetic diversity in the mix. Some of this has been sold to bakers such as The Small Food Bakery in Nottingham (winners of 2018 BBC Food and Farming Awards!). We have really enjoyed building relationships with people along the value chain who are interested in how we produce food and want to support us to farm using agroecology. Longer term we are also considering establishing an on-farm mill. We are also looking at diversity at a variety level. 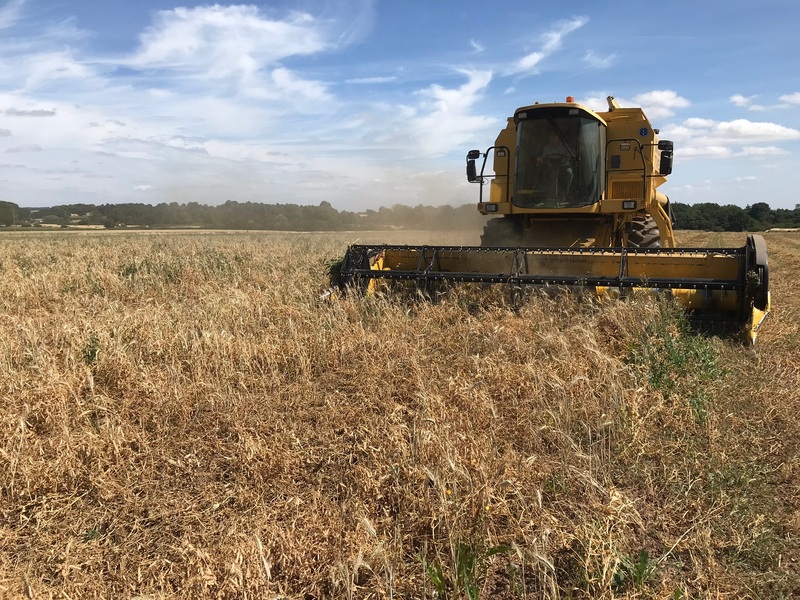 We are part of a network of seven farmers trialling organic wheat varieties with the Organic Research Centre and Organic Arable. We are each growing a selection of winter wheat varieties in different combinations to enable comparison between them. I have chosen to grow all seven varieties to help showcase the trial and to gain more insight on the farm. 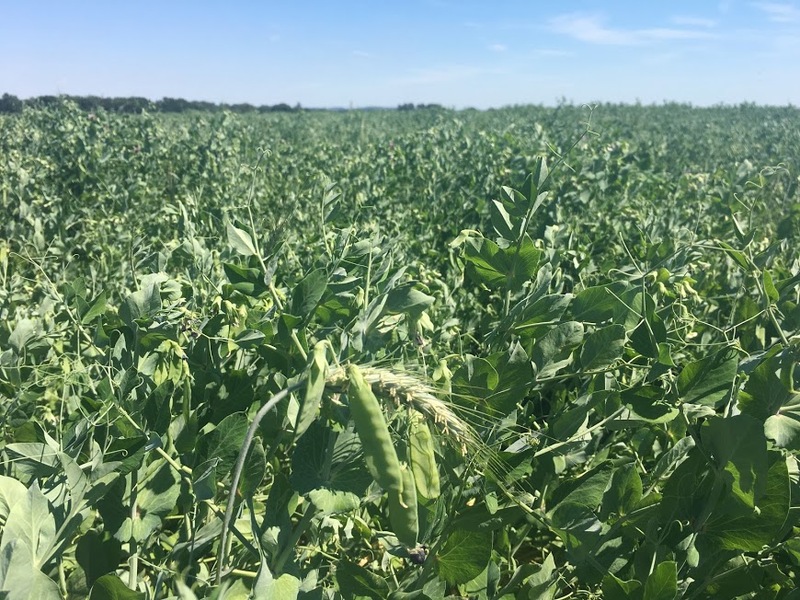 The enterprise is being funded in part by LIVESEED, an EU project designed to try to boost organic seed and breeding across Europe. I am also keen to enhance diversity at a crop level - both over time by diversifying the rotation and in space through practices such as undersowing and intercropping. Carlin peas (see below) marketed as ‘black badger’ are a pea traditionally eaten on Bonfire night in Lancashire. They have a lot of biomass and often end up on the floor, affecting yield and quality, so I was looking for a cereal to provide some scaffolding. 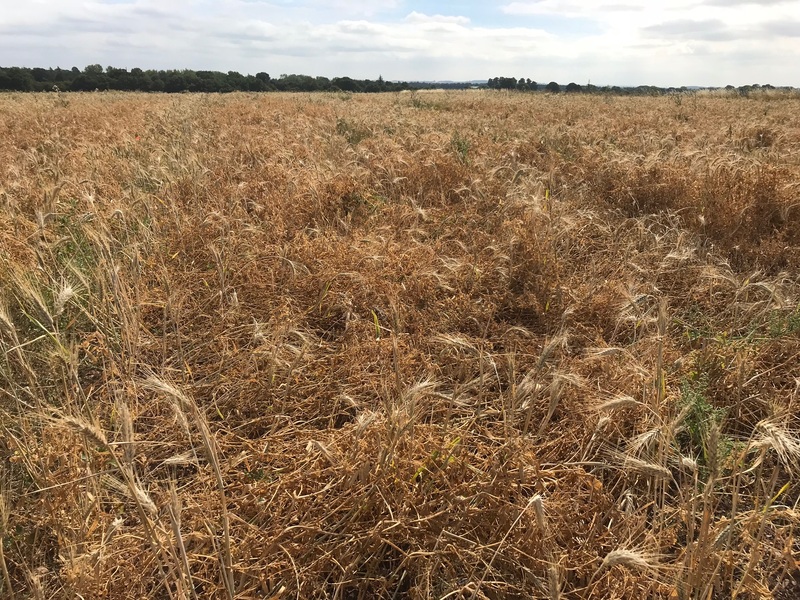 Last year, as part of the DIVERSify / Innovative Farmers Field Lab, we did an intercrop trial with different seed rates of triticale (0%, 5%, 10%, 20% and 30%RD) in full rate carlin peas (240kg/ha) in 1 ha strips across the field to see what the impact would be on lodging. 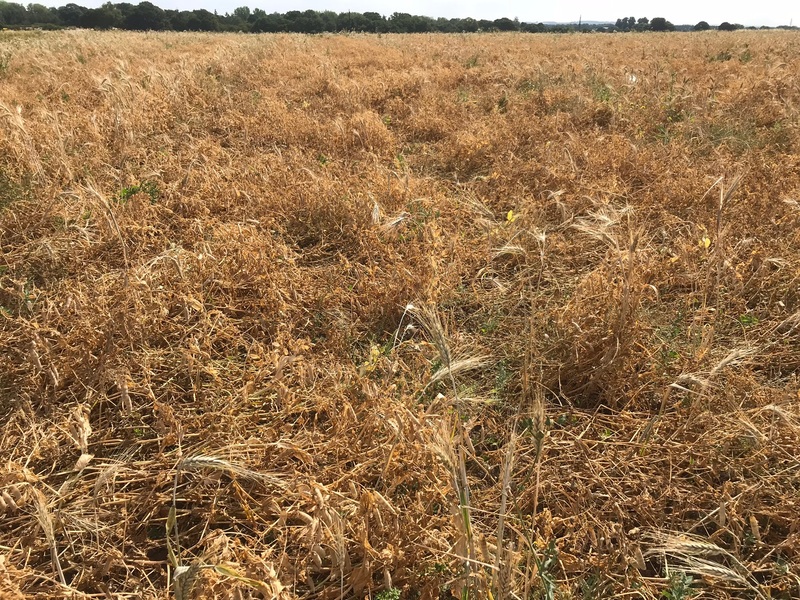 Visual assessment at harvest suggested that 20% and 30% were doing the best job at holding the crop off the floor (although the thistles were also helping in the 0%!) and the 30% was definitely the easiest to harvest. However, analysis of the yield showed no significant difference between the treatments. This was a low lodging year and there was not a large amount of loss in any of the treatments, but I think that if we were to do it again I would go for the higher rates and possibly higher. You can see more about our trials in this video. We have been undersowing since the farm became organic - usually when crops are about 8 -10 cm at tillering - early May. We use an Opico harrow with an air seeder and broadcast it into the harrow - we may do it next year with a homemade front mounted air seeder. 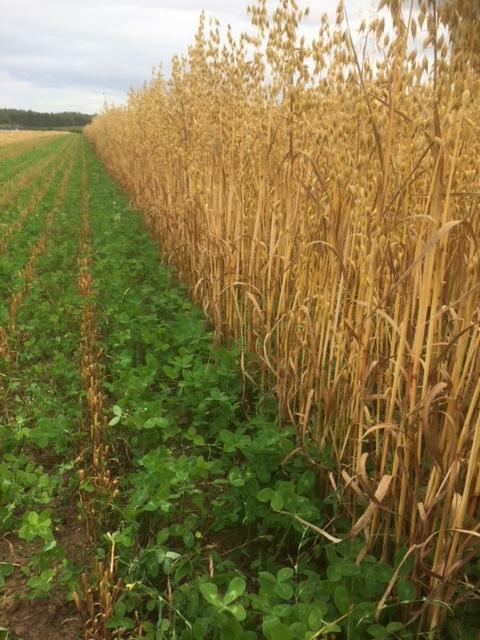 Our rotation is changing all the time but currently includes clover ley, winter wheat, fodder beet, spring peas, and spring oats undersown with clover (see right). 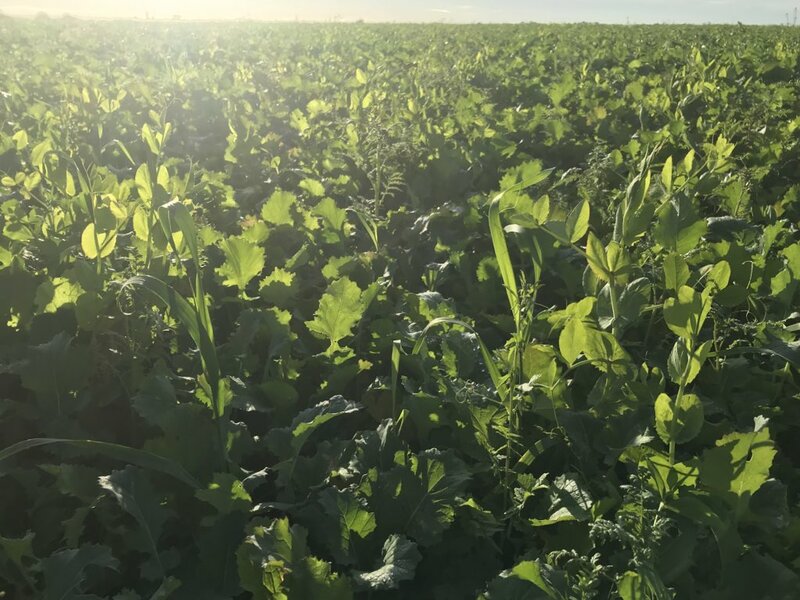 We will see how successful the beet is, but the principle of a completely different crop has clear merits in relation to interrupting the lifecycles of some of our problem weeds. We have always had cattle but this year brought in sheep to help with weed control (particularly docks). We don’t have too much ambition to make large profits out of them but feel they add to the diversity of the business. We see the advantages, but it has been hard work! We have been growing 1 year leys - undersown so they last for 18 months. We have now diversified the mixtures and are adding more grass species and clover. We are interested in more diverse mixtures, but as we have a short ley we are not sure we would get the benefit from the deeper rooting species etc. to justify the cost. We have increased diversity in our cover crop mixtures (see right) and moved from just using brassicas to over 7 or 8 species mix in one field, and for the first time have added seed into mixtures (buckwheat and phacelia) to encourage mycorrhizal fungi. The other thing I have realised is that you have to accept different levels of diversity - weeds and pests are part of the diversity, as are their enemies! We have more biodiversity on the farm because we don’t spray and weeds and pests are not always the problem we thought they were going to be! We are also building agroforestry into our system and are in the second phase of planting trees, this time from the Woodland Trust. We have planted wide rows with 9 hazels planted inbetween rows of walnut. The idea is that the hazel will be cut on a 5 year rotation, with 20% cut each year, to provide wood for our biomass boiler. The rows are running east to west to provide maximum shade and shelter on the north side, where it borders with a field which has a grass ley in rotation. The idea is that it will provide shade for cattle in summer and shelter for sheep in winter. As the grass ley is coming out, we will harvest from the line on the edge, that way the cattle and sheep will have the benefit of the highest line of hazel. It is all about diversity! First of all, it makes life more interesting! But we also think that diversity across the farm builds resilience. We are keen to increase diversity of the crops, the business and the people we work with. Connecting with the people who eat and process our food makes us feel like food producers rather than commodity producers and is much more rewarding! We started working with Homedod’s (who won the 2017 BBC Food and Farming Awards!) about 5 years ago. 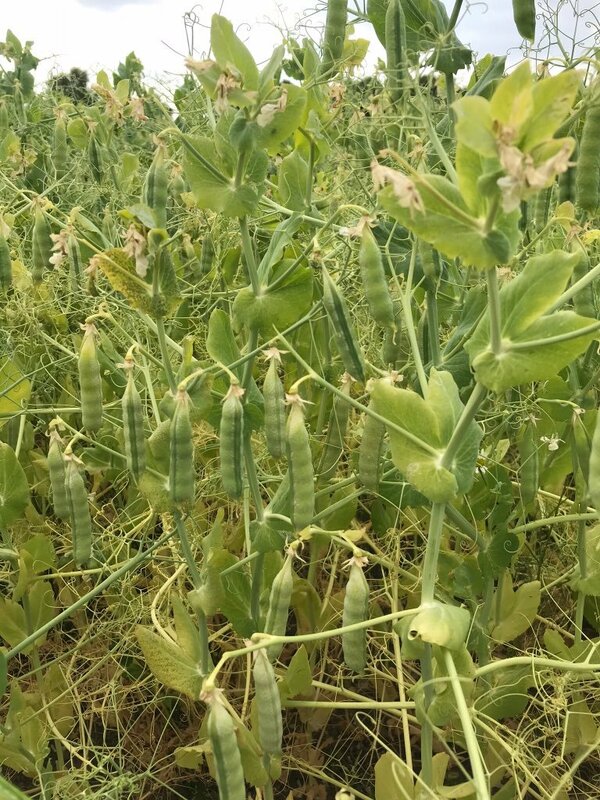 We valued peas in our rotation but felt they were not fairly valued by markets, especially given how difficult they are to grow. We started growing yellow (see right), blue and marrow fat and carlin peas for Homedod's. This has not only helped us to maintain a diverse rotation but has also helped us build meaningful connections with our customers. We are growing heritage varieties and populations which we think have a lot of potential in a low input sustainable farming system. 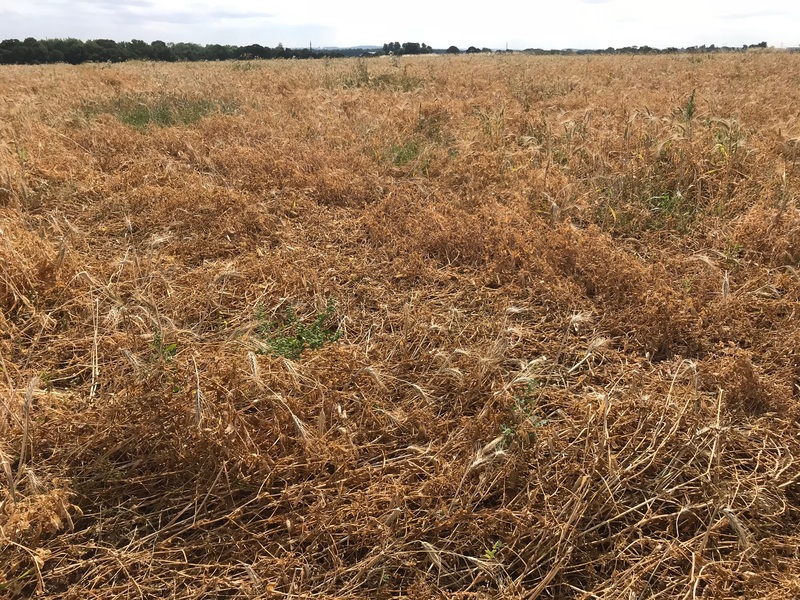 Weed suppression can be fantastic, they are good at scavenging nutrients and they could hold resilience to pest and climatic variability that we have lost in breeding modern varieties. I feel sure that the principles of agroecology are evident throughout our whole business. The way everything fits together has always been a priority and is I think essential in organic farming. Embrace diversity in every way! It’s a fashionable thing to say, but its true! Get closer to your market and become food producer - bakers, millers - they will inspire you, give you new ideas and make life more interesting! Don’t be afraid to try things out! Mark is a key contributor to the UK Grain Lab, a project supported by and co-founded by OF&G. It is a collaborative project where seed breeders, farmers, millers, bakers and chefs all come together to share knowledge and insight to drive better seed and grain development for greater agronomics for low and zero input agriculture while also building flavour and nutrition in grains and end products.